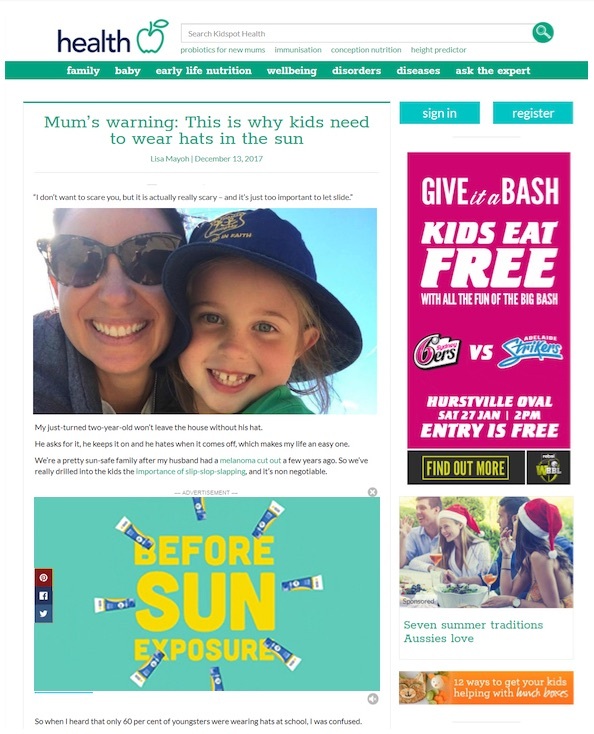 For this campaign, Cancer Council’s goal was to generate enhanced awareness around the correct application of sunscreen. They knew there was an issue and had created a 55 second stop animation educational video, but needed our help to maximise its reach. The success criteria for this campaign wasn’t only total views, but completed views. We knew who our audience was and, to make a difference, we needed as many as possible to watch the whole video. As this campaign was new and had never been run before, we also had nothing to benchmark against. We decided to benchmark against the industry average of 30% completion for a 30 second videos. To hit that rate with a video nearly twice the length was going to be difficult, but for such a worthwhile cause, we were definitely up for the challenge. Targeting social, programmatic and video platforms, we advised the client to run a one month test campaign in Queensland prior to campaign launch. This made sense to us as they hit warmer temperatures earlier in the year than the other southern states. This would help drive insights we could apply when the whole campaign went live. The data gained, plus the platforms used would ensure we hit our audience at the right point in time. From our test month, we identified a set of factors that helped increase video completions. What was even more interesting was that these factors varied by media platform. 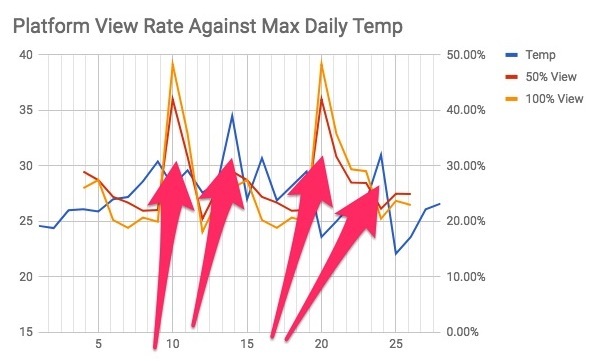 One example was daily temperature. Certain platforms performed better on the lead in to peak temperatures, whilst others performed optimally at peak temperatures. So, we set up our systems to maximise the video serving by platform to match these factors. 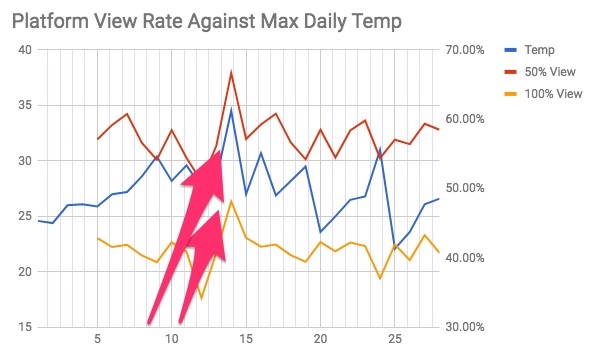 The image below shows a platform delivering higher video completions (red and yellow) on warmer temperature days (blue). The higher the temperature, the greater the chance of view completions. Cancer Council’s video was viewed over 2.7 million times. Around 1 million people, watched the entire 55 second video. In a country where 2 in 3 people will be diagnosed with skin cancer before they reach 70, these results really mattered. If you’d like to know more about this campaign, or to understand how to make sense of your data to optimise your campaigns, drop me a line. The image below shows our video placement in contextually relevant environments.